Labonté, whose public persona is so poor he’s being outpolled by the city’s equivalent of Ralph Nader, has a lot of work to do in those seven months if he’s going to be competitive in this fall’s election – both in his race for mayor and the downticket races for city councillors and borough executives that his party’s future depends on. His main fault is that nobody knows anything about him or what he’s about, other than his rather public falling out with Mayor Gérald Tremblay. That’s a problem entirely of his doing. When you see interviews or campaign videos, you hear words like “audace” and “espoir” and “intégrité” and whatever. But Tremblay could say the same about himself. There’s no differentiation between the two of them. It’s not a question of message. The two men simply don’t diverge enough in their opinions. Labonté is big on sustainable development and green policy (for the most part – see below). But so is Tremblay. Labonté wants the private sector to contribute to make this city better. But so does Tremblay. 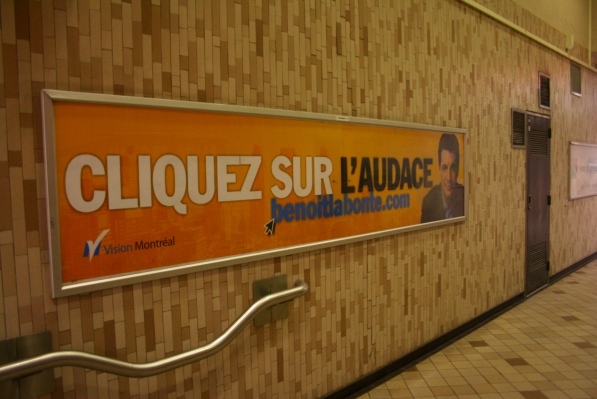 Labonté’s image problem stems from the simple fact that Tremblay has actually been a pretty good mayor. Sure, he’s had issues with the demerged suburbs, his executive committee performs far too much of the people’s work behind closed doors, the municipal bureaucracy is horribly bloated and the unions all hate his guts. But none of that would change in a Labonté administration. I tried to look at Vision Montreal’s platform to see what kind of policies they would follow, what kind of bylaws they would pass and what kind of budget they would create that would be different than the current administration. But I couldn’t find one, either on Labonté’s website or on the Vision Montreal one. Even his political “manifesto” doesn’t include any specific ideas in its 2,347 words. The closest thing I could find were a couple of videos posted a year ago, including the one above, which outline some things he’s done as borough mayor. But I’ve already pointed out the flaws in these (to recap: his plastic bag recycling system creates waste where there was none before; his Parco-Don is a gimmick that isn’t bringing in much money; and to add a new one – his commitment to pedestrianization of streets is tainted by his demand to get rid of a reserved bus lane in the Old Port because it interferes with traffic and parking). UPDATE (April 11): Spacing Montreal has links to show Labonté’s inconsistencies when it comes to his policies. Labonté needs to figure out what he’s about. Perhaps my view is tainted by the fact that he lied to me the one time I interviewed him, but I don’t think I’m the only one whose first impression of him is of a self-obsessed politician who will pander to whoever is necessary to win an election. Fortunately, he has seven months to fix that image and present a vision that has more ideas and fewer vague political clichés. Oh, and since I criticized Tremblay’s party website for having too many photos of him on it, I should probably point out that Labonté’s website has half a dozen photos of him on it too. Benoit Labonté could be a clone of Tremblay and nobody would know the difference. Both of them are managerial types that basically don’t want to rock the boat. They seem to be willing to make changes on the margins but radical changes – all talk no action. Right now, Labonté has absolutely no platform! The only thing you see is his “audace / espoir / intégrité” line which is what he said when he became leader of the (lack of) vision party. In contrast, Projet Montréal is brimming with ideas about how to bring back democracy and improve the quality of life of citizens. They are best known for the Tramway proposal but their platform is much wider than that! I thaught that that Recycling bag thing was pretty neat. Downtown’s much cleaner now that papers aren’t blown out of the green bins anytime it’s slightly windy. I use a blue plastic bag at home. I understand that that’s a problem (I’ve never had it happen with my recycling bin because I’m careful about packing it, but whatever. But I’d like to think a reusable bin can be engineered so it doesn’t create waste and doesn’t let papers fly around everywhere. In fact, it already has been. Labonté is just a Bourque lackey. Don’t forget that Bourque eliminated the democratic consultation apparatus laid down by Jean Doré, and he gutted transit service. And 8 years after Bourque was booted, the transit service level has not gotten back to where it was before being gutted by Bourque. 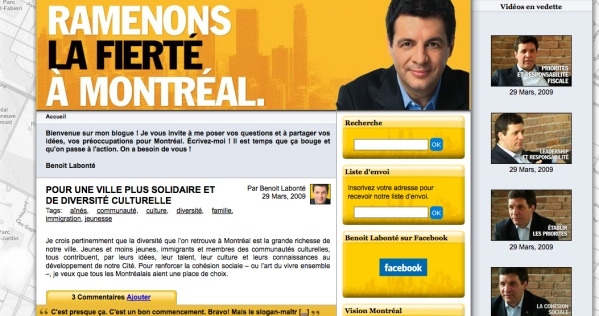 Labonté was brought into municipal politics by Tremblay, not Bourque. How is he a Bourque lackey? How is he a Bourque lackey? The “Vision Montréal” label. The gang there are the particularly clueless drones that orbited around Géranium Pommier. Whatever qualities he may have (can’t really say anything off-hand, except that he may prompt seamstresses to go “oooh” and “aaah” over his mug plastered on electoral posters) will promptly brought down by the petty hivethink in that reactionary party. As a Ville-Marie borough resident for the last 8 years I am very disappointed in the current Tremblay administration for their lack of transperancy and credibility. Very highly publicized issues such as Park Avenue, The Shriners (almost lost, again! ), F1, World Aquatics Championships etc….. All of these situations on the world stage created lost credibility with the public and mismanagement of public funds. I will not gather up any details. If people are curious enough to find out what I am referring to simply search any newspaper archive. All of these events were under the CURRENT Tremblay administration. Benoit Labonté offers an alternative voice and I would like to see him as part of the next administration in November 2009. M. Labonté’s voice is beginning to sound louder and clearer as to why he left the Tremblay administration in September 2007. The lack of responsibility and abuse of power in the CURRENT executive committee is all the more apparent today. Mr. Tremblay has to call upon the city’s auditor general twice in the last few months (once for the SHDM = still prending and for the awarded contract to GéniEAU = new). I would like to know what reason is there to re-elect an incompetent administration on November 1st 2009 ? Just how would Labonté have kept the F1 in Montreal? By handing over $175 million? Even local merchants agree that rejecting that huge price tag was the right thing to do. It’s one thing to complain about everything bad that happens, but it’s another to walk the line yourself. I cannot speak for M. Labonté however the point is that the CURRENT mayor lacked leadership in mobilizing private entrepreneurs and sponsorships. Forget about using public money. The key issue is to maintain and continue to maintain relationships with those partners that bring these high profile events to Montreal. Negotiations were weak and unfortunately we lost a world class event. How is three levels of government travelling to Europe “weak” negotiations? If merchants agreed that $175 million of public money was too much, what makes you think they would front the money themselves? Broadcast rights to the Olympics don’t cost that much. If Montreal is supposed to be the “creative” city, or the city of arts, or multimedia, or decent public transportation, or bohemia, or French, maybe the money that had been spent on the F1 will now be able to be put to better use, a use that doesn’t contradict directly with all of these larger, better goals. I was so tired of having the F1 goons take over St-Lo every summer. Congratulations to M. Labonté for his persistence on shedding some light on the irresponsible behaviour of the current Tremblay administration ! Funny how Zampino left quietly in July 2008 and went on to work for the same company that is currently under investigation for fraud ! The largest city contract ever awarded to a company called GéniEau was under the “watchful” eye of the president of the executive committee of the city of Montreal (Frank Zampino). Zampino was Tremblay’s right hand guy. Was Tremblay not aware of this shady deal ? Hello ????? 350 million dollars ??? Before he signed on the dotted line did he due his DD (due diligence) ? Now he “suspended” the contract until further notice awaiting the auditor’s report. Had the bids been done appropriately in the first place we would not have to be going through this again ! It is quite worrisome to have a “leader” surrounded by such incompetence. Ethics and integrity are not words that should be lived by after the damage is done. Although it’s fairly obvious from your posts that you’re close to the Vision Montreal party, don’t you think you should disclose your rather obvious conflict of interest here? Vision Montréal has no credibility whatsoever. Under Bourque, they gutted the consulting apparatus and stuffed city council with little merchants who don’t understand anything beyond running a small shop, and do not grasp that a government cannot be managed like one either. What is needed is a proper left-wing municipal party that will kick the cars out of Montréal by taxing them to death. And then, we’ll party like it’s 1990! I can’t even vote because my suburb demerged out of the city (I wanted us to stay). Oh well! Taxation without representation! Oh My ! What a fine comeback ! Speaking as a Montrealer who actually voted for Tremblay in 2005 I am at a loss for words. Since the last post so much has been said in the media about Tremblay’s lack of responsibility and leadership. Today “La Presse” is “asking” for the mayor to resign and to not seek a third mandate. I believe that Tremblay is a complete failure as a mayor. He has plunged our city further down into the abyss. No leadership, integrity and mayoral responsibility in him whatsoever. I and along with many other FORMER supporters are embarrassed to say that we originally supported this mayor. We need change in this city and not more of the same regardless of the candidate/party. I believe that Tremblay is a complete failure as a mayor.